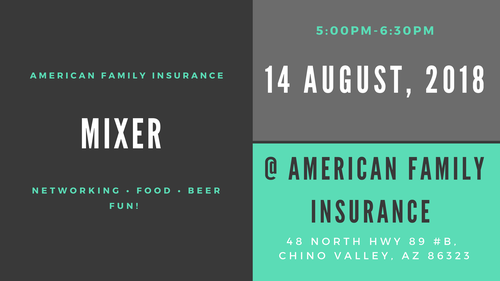 Get involved with the community, make new connections, and learn about the Chino Valley businesses and nonprofits that host these social events! Chamber Mixers are hosted by Chamber members on the 3rd Tuesday of each month from 5:00-6:30pm. Hosts typically provide refreshments and door prizes. Attendees are welcome to drop in any time during the event. Make sure to look for the welcome table to sign in and receive a nametag to help with new introductions! Individuals, colleagues, and friends are all encouraged to attend. Monthly after hours hours and community networking event open to the public.